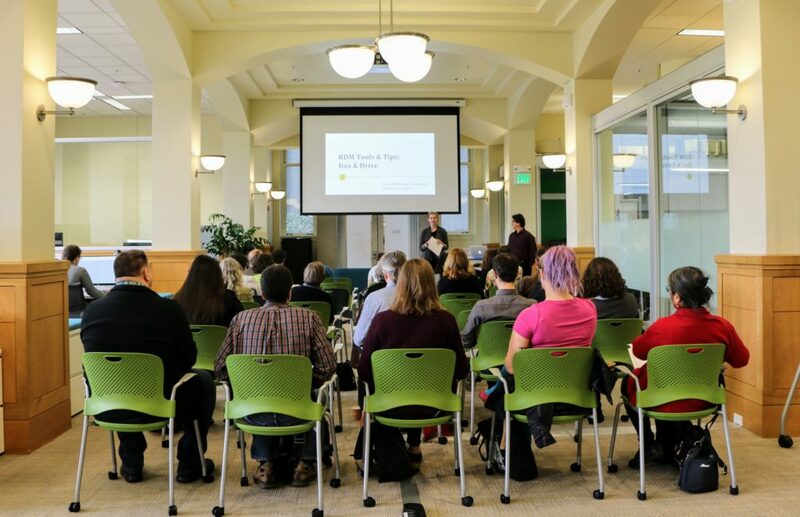 This week, the University Library and the Research Data Management program were delighted to participate in the Love Your Data (LYD) Week campaign by hosting a series of workshops designed to help researchers, data specialists, and librarians to better address and plan for research data needs. The workshops covered issues related to managing, securing, publishing, and licensing data. 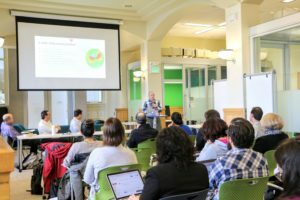 Participants from many campus groups (e.g., LBNL, CSS-IT) were eager to continue the stimulating conversation around data management. Check out the full program and information about the presented topics. Photographs by Yasmin AlNoamany for the University Library. The Securing Research Data Panel. 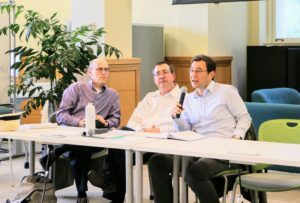 Jon Stiles (D-Lab, Federal Statistical RDC), Jesse Rothstein (Public Policy and Economics, IRLE), Carl Mason (Demography). 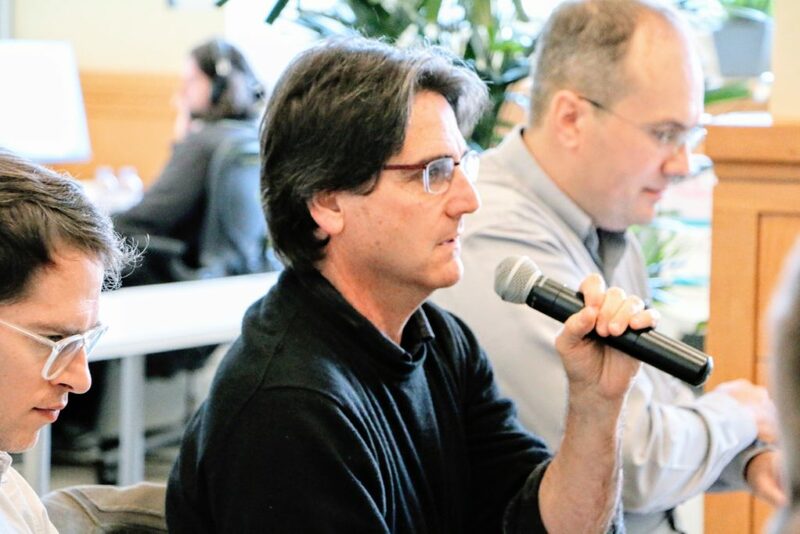 The discussion centered upon the rewards and challenges of supporting groundbreaking research when the underlying research data is sensitive or restricted. In a lively debate, various social science researchers detailed their experiences working with sensitive research data and highlighted what has worked and what has proved difficult. Chris Hoffman illustrated Securing Research Data – A campus-wide project. At the end, Chris Hoffman, the Program Director of the Research Data Management program, described a campus-wide project about Securing Research Data. Hoffman said the goals of the project are to improve guidance for researchers, benchmark other institutions’ services, and assess the demand and make recommendations to campus. Hoffman asked the attendees for their input about the services that the campus provides. The attendees of Securing Research Data workshop ask questions about data protection. Rick Jaffe and Anna Sackmann in the RDM Tools and Tips: Box and Drive workshop. 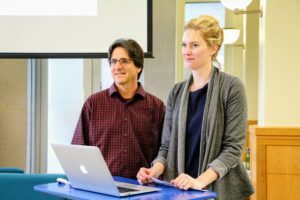 On the second day, we hosted a workshop about the best practices for using Box and bDrive to manage documents, files and other digital assets by Rick Jaffe (Research IT) and Anna Sackmann (UC Berkeley Library). The workshop covered multiple issues about using Box and bDrive such as the key characteristics, and personal and collaborative use features and tools (including control permissions, special purpose accounts, pushing and retrieving files, and more). The workshop also covered the difference between the commercial and campus (enterprise) versions of Box and Drive. Check out the RDM Tools and Tips: Box and Drive presentation. Anna and Rick ask attendees to do a group activity to get them talking about their workflow. Anna Sackmann talks about publishing research data at UC Berkeley. In the first part of the workshop, Anna Sackmann talked about reasons to publish and share research data on both practical and theoretical levels. She discussed relevant data repositories that UC Berkeley and other entities offer, and provided criteria for selecting a repository. Check out Anna Sackmann’s presentation about Data Publishing. Anna Sackmann differentiates between different repositories in UC Berkeley. Rachael Samberg, UC Berkeley’s Scholarly Communication Officer. 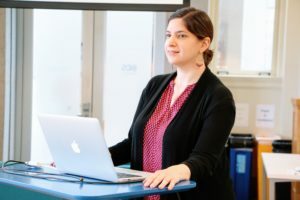 During the second part of the presentation, Rachael Samberg illustrated the importance of licensing data for reuse and how the agreements researchers enter into and copyright affects licensing rights and choices. She also distinguished between data attribution and licensing. Samberg mentioned that data licensing helps resolve ambiguity about permissions to use data sets and incentivizes others to reuse and cite data. 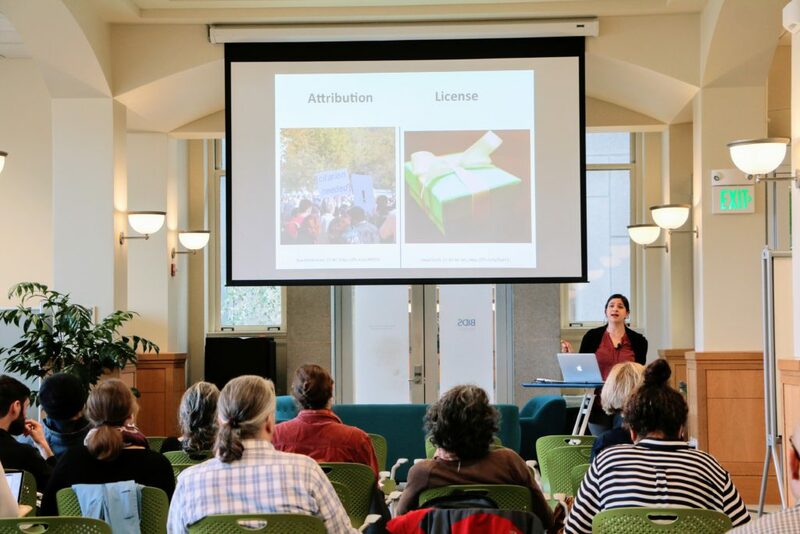 At the end, Samberg explained how people can license their data and advised UC Berkeley workshop participants to contact her with any questions about data licensing. Rachael Samberg explains the difference between attribution and license. Check out the slides from Rachael Samberg’s presentation about data licensing below. The workshops received positive feedback from the attendees. 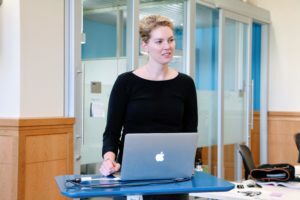 Attendees also expressed their interest in having similar workshops to understand the broader perspectives and skills needed to help researchers manage their data. Special thanks to Rachael Samberg for editing this post. 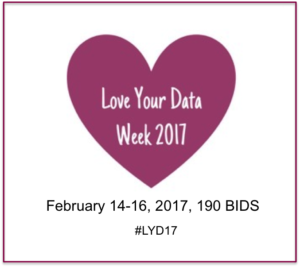 Love Your Data (LYD) Week is a nationwide campaign designed to raise awareness about research data management, sharing, and preservation. 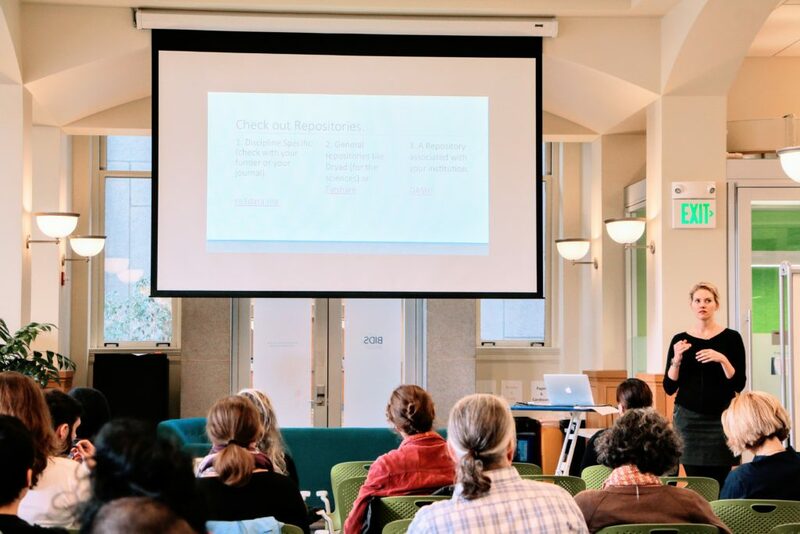 In UC Berkeley, the University Library and the Research Data Management program will host a set of events that will be held from February 13th-17th to encourage and teach researchers how to manage, secure, publish, and license their data. Presenters will describe groundbreaking research on sensitive or restricted data and explore services needed to unlock the research potential of restricted data. Graduate students, researchers, librarians and data specialists are invited to attend these events and learn multiple data services that the campus provides. Securing Research Data – Explore services needed to unlock the research potential of restricted data. For more background on the Securing Research Data project, please see this RIT News article. RDM Tools & Tips: Box and Drive – Learn the best practices for using Box and bDrive to manage documents, files, and other digital assets. Refreshments are provided by the UC Berkeley Library. Research Data Publishing and Licensing – This workshop covers why and how to publish and license your research data. The presenters will share practical tips, resources, and stories to help researchers at different stages in their research process. Sponsored and organized by the UC Berkeley Library and the Research Data Management. Contact yasmin@berkeley.edu or quinnd@berkeley.edu with questions.